Inflatable boats are an excellent option for those who want to fish or relax on the water without the expense of a traditional boat. The best inflatable boats and dinghies are portable and lightweight so they can be transported right in the trunk of your car. Many of them even come fully equipped with rod holders, oar holders, comfy seats, and even motor mounts. We’ve researched all of the most popular models available to help you make an informed decision about which inflatable boat is right for you. Intex Mariner 4 10.8 ft. 4 880 lbs. BRIS BSA380 12.5 ft. 6 1,675 lbs. Newport Vessels Dana 8.8 ft. 3 1,067 lbs. Airhead Angler Bay 11.7 ft. 6 900 lbs. Inflatable Sport Boats Shark 9.7 ft. 5 1,158 lbs. Intex Excursion 5 12.0 ft. 5 1,300 lbs. Hydro-Force Marine Pro 9.6 ft. 2 594 lbs. Intex Seahawk 4 11.1 ft. 4 814 lbs. The Intex Mariner 4 is a four-person blow-up boat that comes complete with two aluminum oars and a high output air pump to get you out on the water faster. The boat has a robust molecular structure that makes it extra resistant against impact and sun damage. The Mariner has been designed with four Boston valves to allow for faster inflation and deflation. We love the inflatable keel on this boat because it allows for better handling and control. The boat has also been designed with durable rock guard lines all the way around the hull for additional protection against holes. This inflatable raft is great for fishing because it features rotating oar locks and holders, two fishing rod holders, three seat cushions, an all-around grab line, battery and gear pouches, and a motor mount fitting for mounting an electric trolling motor. Users highly recommend this boat for fishing excursions and recreational use, but there were a few who felt the floor was a bit too flimsy. The raft can be deflated and stored in its own carry bag, so it’s very convenient for those who don’t have a place to park a boat and trailer. The Mariner 4 is USCG approved and can be registered if you add a motor. For the price, it’s no wonder the Mariner 4 is considered by many to be the best inflatable boat for the money. The BRIS “Fish Hunter” inflatable boat is as close as you’ll get to the durability of a conventional rigid boat with all the benefits of an inflatable. It’s made out of premium materials and the quality shows. If your budget allows, THIS is the inflatable boat to get. Large enough to accommodate up to six people, this inflatable dinghy is constructed of 2,000 Dtex, 1.2mm PVC fabric with polyester support to provide superior rip and tear resistance. Every seam has been heat welded to provide longevity when used in either fresh or salt water. For added strength and durability, the manufacturer has even quadruple overlapped most of the seams during construction. The BSA380 also has three air chambers and a one-way drain valve. We love the deep V-keel on this model that allows for easy planing. Additional key features of this inflatable raft include a durable marine plywood transom for adding an outboard motor (up to 25 HP! ), oarlocks for easy rowing, two aluminum bench seats, and aluminum floor panels for stability. This BRIS fishing boat also comes with a set of aluminum oars, a foot pump, and a carry bag. The Fish Hunter is USCG approved and can be registered if you choose to add a motor. Although this inflatable boat is more expensive than others on our list, the overwhelming majority of owners feel that it is well worth the purchase price. Purchasers receive a 30-day money back guarantee and a three-year manufacturer’s warranty. While the boat is on the heavy side (180 lbs. ), it has a 1,675 lb. weight capacity so it’s as stable as they come. If you go out on the water regularly, don’t plan on spending $200 on a boat thinking it will last you for years. Spend the extra money up front on this model and you’ll get more enjoyment out of it and it’ll outlast almost anything out there. The Dana is a high quality inflatable dinghy that comes with a sturdy, four-piece marine wood floor with aluminum framing. This three-person inflatable boat was designed with an air keel for easy planing and better maneuverability. It comes equipped with topside d-rings for adding a Bimini cover and other accessories. The boat itself is constructed of .9 mm thick, 1,100 Denier PVC for durability. This inflatable pontoon boat comes with everything you need to get out on the water, including an aluminum bench seat, two aluminum oars, a foot pump, and a repair kit. The boat is easily transported in the backseat or trunk of a car, and its compact, portable design makes it great for camping. It even comes with its own carry bag. Owners are generally impressed with this boat’s stability on the water, but many wished it was larger to accommodate more people comfortably. While it is possible to fit three adults, two will fit more comfortably. Assembly is fairly easy and takes about 15-20 minutes for one person. The boat will take up to a 10hp outboard motor but most users match it up to one of the many excellent electric trolling motors by the same company. The Dana is USCG approved, but it must be registered if you add a motor. The manufacturer provides a two-year warranty with the purchase of this product. Excellent high-quality boat for the money. 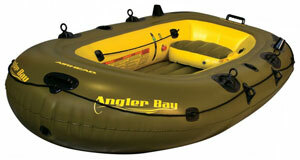 The Angler Bay inflatable raft is available in three sizes: 3-person, 4-person, and 6-person with the later probably being the most popular. This boat is excellent for fishing and comes complete with rod holders, oar holders, and molded drink holders. The boat has been designed with an all-around grab line and sturdy grab handles. Owners report that this inflatable raft is easy to inflate and deflate, and it’s great for taking on camping trips. It comes with an inflatable floor and two movable seat cushions but you will need to purchase a separate transom mount if you wish to add a trolling motor. The Angler Bay is designed with three air chambers for security and stability. Most users were pleased with their purchase, but they report that the boat does not hold as many people as the manufacturer claims which is common which is as common with boats as it is with tents. While 2-3 adults will fit comfortably in this boat, 6 is definitely a stretch unless they are mainly small kids. This boat does not come with oars so they will have to be purchased separately but oars are often one of the first things to upgrade so it’s nice to choose your own. Airhead is known for producing some of the best inflatable towable tubes and this inflatable boat proves they have another winner on their hands. It’s a great option for fishermen who don’t have the money to spend on a regular boat. The Shark Model 300 premium dinghy has a sleek design for faster planing at takeoff. The extended rear pontoons can accommodate more weight and larger motors without sacrificing stability. This boat also has two aluminum seats and an aluminum floor that are incredibly durable, yet lightweight and portable. All seams on the Shark are heat welded to allow for use on the lake or river and in the ocean. The boat itself is constructed of .99mm thick, 1,100 denier reinforced PVC to make it UV, stain, and puncture resistant. Additional key features of this boat include removable seat cushions, a set of aluminum oars with lock-holders, a foot pump that actually works well, heavy-duty carry handles, and two front towing d-rings. Many users say it’s the absolute perfect size to take out for a quick day trip on the lake. Grab your fishing life vest and you’re ready to go. This boat is USCG approved and can be registered if you decide to add a motor. Owners love this boat for fishing or simply taking the family out and cruising on fresh or salt water. It’s a bit more expensive than others but the build quality is top notch to allow years of reliable use. 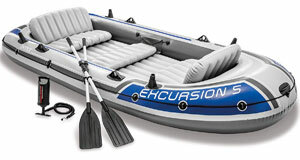 The Excursion is a good, cheap inflatable boat made to accommodate five people (realistically 2 adults + 2 kids comfortably). It has been constructed with three air chambers plus an additional chamber in the hull for added buoyancy. It inflates and deflates quickly, and a high output air pump is included with the purchase. Additional key features include inflatable seats with backrests, motor mount fittings, oar locks, oar holders, fishing rod holders, and sturdy grab handles for easy carrying. The Excursion is constructed of heavy-duty vinyl for puncture resistance. Two oars are also included but most users end up installing some type of trolling motor. Although this blow-up boat is one of the more affordable ones on our list, several reviewers reported that they had issues with it not being as durable as they were expecting. But as long as you know its limits, this is one of the “most fun for the money” purchases you may make. Easy to transport, easy to setup, and easy on your wallet. The Marine Pro inflatable raft is constructed of extra-strength, 3-ply reinforced vinyl. It features a high-pressure inflatable floor for stability. The Marine Pro can safely accommodate two adults and one child, but children should always wear a life jacket on the water. Motor mount grommets, an all-around grab rope, oar locks, two aluminum oars, and inflatable seat cushions are included with this model. It’s one of the easiest boats you’ll ever set up. This model is at a good price point but has mixed reviews. While some users were quite happy with the purchase, others felt the boat wasn’t durable enough to hold up to regular use. What’s nice though is that with a little plywood and pipe insulation, you can easily upgrade the floor. Add a small trolling motor and you you’ll enjoy countless hours of fishing or just relaxing on the water. The Hydro-Force is a very lightweight option making it perfect for those who want to pack it in for camping or use infrequently. The Seahawk 4 is one of the most affordable options available, and it’s a great little boat for the price. It can accommodate four adults for fishing or just relaxing on the water. Built in rod holders, motor mount fittings, a secure grab handle, and an all-around grab line are included. The Seahawk 4 comes with two oars and has built-in oar locks and holders. This inflatable kayak is constructed of heavy-duty, puncture-resistant PVC puncture resistance and comfort. It features three air chambers plus an additional inner chamber inside the hull for added safety. Inflatable seat cushions are also included with this model for extra comfort. The Seahawk 4 is US Coast Guard approved and can be registered if you want to add your own motor. Most owners were very impressed with the quality of this boat, especially for the price, but some found it prone to leaks and difficult to steer. Sure there are better options, but for light use at a price almost anyone can afford, it makes for a good inflatable boat. Yes, absolutely! Inflatable boats are just as safe as traditional boats. In fact, they may be even safer than traditional canoes and kayaks because they won’t tip over and they’re easy to climb on to, even in deep water. Like with conventional boats, life jackets are always recommended, especially for kids. Yes! Inflatable boats are very versatile, and they’re great for fishing. They’re also portable and take up very little space, which makes them an excellent option for camping/fishing trips where towing a traditional boat might not be an option. Can you add a motor to an inflatable boat? Yes, you can add a small electric trolling motor or gas motor to an inflatable boat. However, once you add a motor to your boat, it will need to be registered in your state, just like a traditional boat. Inflatable boats are a great choice for anyone who doesn’t want the expense or hassle of owning a traditional boat. With a little research, you can get some great features in a very affordable package. Is it Safe to Bring Babies on Boats?